We're getting close to BoS USA 2018 - it's happening on 1-3 October in Boston - less than 3 weeks. In this newsletter we've got the final 3 speaker announcements, and the first talk from BoS Europe 2018 earlier this year - by a speaker who's also returning to speak at BoS USA in Boston next month. If you haven't been before and you are thinking of taking the plunge, we're always happy to answer any questions you might have about whether BoS is right for you. This is not your typical conference. It's single track, the talks are engaging but 'long-form' - you get to dig into the detail, hear about the mistakes and challenges that people make as they build a software company, not just listen to a PR pitch. Trust us, you will be in great company and if you attend and don't feel you get value, we will refund your money. If you want a perspective from someone that has been, this, 'Why I was completely wrong about Business of Software Conference', gives you a good idea about what to expect and why you should consider investing in yourself. 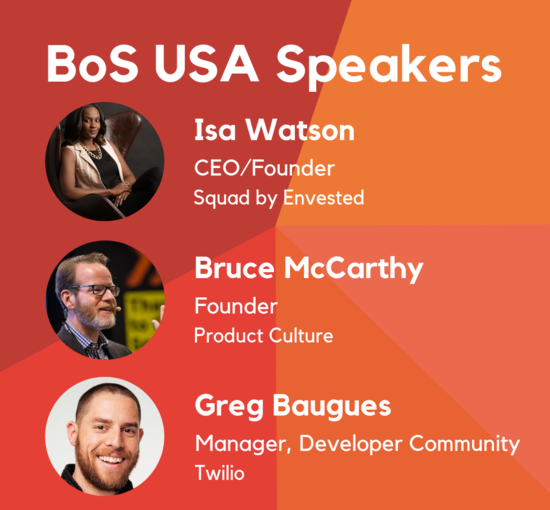 We're delighted to announce 3 new speakers for #BoS2018 - Isa Watson, Bruce McCarthy, and Greg Baugues. Isa Watson is the CEO/Founder of Squad by Envested, who help you create community in your offices by introducing employees with similar interests who might otherwise not meet. She'll be speaking about Making Workplaces Work For Humans, and why she believes the CEO plays such an important role in building the morale of the whole company. Bruce McCarthy will be a familiar name to BoS Newsletter readers - he spoke at BoS Europe this year (see the video of the great talk below), and gave a workshop at BoS USA last year. Bruce is returning to the BoS stage in Boston next month to talk about Saying No With Confidence: How To Tell The Great Ideas From The Merely Good. Bruce will arm you with his battle-tested approach to prioritizing your most critical initiatives in order to increase your organization's focus. We think this is such a great fit for the event. So many people tell us that the talks and the hallway conversations fill their heads with so many ideas that they can struggle to work out what to do first so Bruce's talk about how to prioritize, ruthlessly, is going to help you come up with a plan of action to take back home. Greg Baugues spoke at BoS USA 2013 about Developers, Entrepreneurs, & Depression - an incredibly honest and brave talk about his own story with depression. Greg will giving a short talk this year at BoS USA titled Mental Health - What You Can Do - an update on his story, and some thoughts on how you can help employees and coworkers who might be struggling with their mental health. (We also have 3 rooms available at the conference rate at the Seaport Hotel, they are not available direct from the hotel and will be gone by the end of the week). Drop us an email when you register and we will send you details. Bruce will also be speaking and leading a workshop at BoS USA 2018 (1-3 October, Boston MA). Find out more here. What makes Business of Software Conference speakers so smart? Like most smart people, they read a lot. We always ask which books have had the biggest influence on their business lives and what they are reading now. 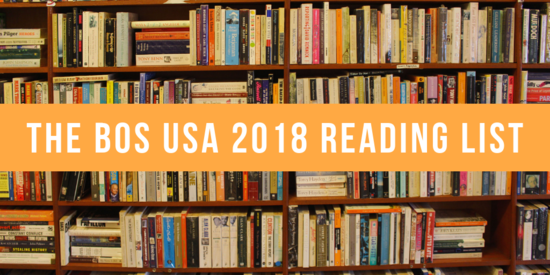 It’s fascinating to hear what books other people read and great to see so many BoS speakers appearing on the list. This year’s book list is here. See what some of the smartest people in software are reading, here. Recently. Wistia's co-founders Chris Savage & Brendan Schwartz turned down the offer to sell the company and have instead taken on $17m of debt – seemingly a strange move. Why? Because Wistia are in it for the long run – they want to run their business their way. On September 18th at 10.00 ET, we'll be talking to Chris Savage, Wistia's CEO & Co-Founder, about the thought process behind the decision, how it affects their future planning, and the pressure of taking on that responsibility as a CEO. Bring your own questions too for Chris to answer in this interactive Hangout. If a very smart and kind friend sent you this and you think it's useful, you can make sure you get the next edition by clicking here. To make sure you keep getting these emails, please add markl@businessofsoftware.org to your address book or white list us. Too many emails? Change your subscription (you can opt for a quarterly update) or unsubscribe. Want to help us get you the most relevant content? You can update your details here.